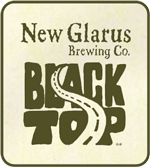 New Glarus Black Top took home the GABF's first ever Black IPA Gold! The new category resolved any confusion over this assertively hoppy jet black ale. Cruise the Black Top on a ride of Black IPA discovery and experience exactly what Black IPAs are brewed to be. Expect this beer to pour a hop forward jet black glass brimming with aromatic bitterness. Master Brewer Daniel Carey skillfully weaves molasses and chocolate malt undertones with a soaring rush of clean citrus and pine hop notes to deliver a drinkable Black IPA. Savor Black Top, like Wisconsin’s miles of licorice ribbons of ink that meander through armies of corn and bovine mowed fields. Enjoy the road less traveled.